MOSCOW, Idaho - Not so long ago, a farmer's wife used to tuck away a small stash of "butter money" - cash earned a few dollars at a time by selling extra eggs, butter or produce. Come a rainy day, she'd have her savings to spend. When her farm was headed for the auction block in 2003, MaryJane Butters, a Utah native and famed organic farmer, made her own version of the cookie-jar account: a $1.35 million deal to write three books about the life of a "farmgirl" - any woman who can bake a pie, love a child, plant a garden or just put a potted pansy on the front porch. "A farmgirl believes in the strong arms of friendship and community, and things made from the heart and from the hands," said the 54-year-old Butters, dubbed "the pioneer Martha" by some. Four years after inking the book deal, she has saved the farm and turned her butter money into a Butters empire: Farmgirls around the nation and the globe emulate her unfussy lifestyle; she's got a line of bedding and linens; her magazine-catalog hybrid will soon by acquired by a major publisher; she has a deal to design clothing and is in negotiations for a line of tools and paints for a home-improvement store chain; her dried, organic foods sell in places like REI and Costco; and she runs a bed and breakfast on her Idaho farm, as well as a school for would-be organic growers. Today, Butters is giving extra thanks. For the first time ever, she said her company will turn a profit this year. "It's been forever coming. A white-knuckle ride, hanging on against all odds," she said. "I feel like I've been fighting for this forever." It's possible none of it would have happened if not for her Utah roots. "Who I am today has a lot to do with the fact that I grew up in that era, in Utah. There was such an emphasis on community and neighborliness and food. There were canneries and people were helping one another. There was an esprit de corps in the neighborhoods," she said. "It had a lot to do with the LDS Church." Descended from pioneers, Butters was raised on the joint virtues of farming and Mormonism in a modest Ogden home "on the wrong side of the tracks" in the 1950s and '60s. "My parents subscribed to two magazines [chosen] because they both fit on the back of the toilet - Readers Digest and Organic Farming," she said. "Every dinner conversation was about crops and harvests." Her father, Allen, kept a huge garden, and donated much of the produce to those in need, including families he visited regularly as a "home teacher" for The Church of Jesus Christ of Latter-day Saints. Her mother, Helen, was a leader in her neighborhood Relief Society, the church's women's organization. The ladies exchanged tips on manners, sewing, cooking and fashion in an atmosphere of cordial competition: comparing how many peaches each woman canned or showing off a hand-tatted hankie during Sacrament meeting. The family raised or hunted their meat and made their clothes. "All that talent that was there, it's dying. . . . Life has gotten so fast," said MaryJane's younger brother, Rex Butters. "I really wish I could live more like that, but our world has changed. Mary is trying to keep it the way it used to be." He is grateful - and a bit envious - that she's been able to keep their family traditions alive. "She's got a lot going on, but she tries to sit down under the plum tree and crochet a rug now and then. I admire her for that. That's the way it was when I was a kid." Butters absorbed the skills and industrious attitude, but always added her own twist. As class historian at Ben Lomond High School in the '70s, she tried to recruit friends for activities she thought would be fun, such as changing the oil in a car. "I had the weirdest ideas," said Butters, who continues to defy stereotypes with her long, blonde tresses, candy-apple-red nails and big earrings. Soon after graduation, she married her high school sweetheart, a union that would last only a year. After that, "I was so ready to get out of there," she said. "I was interested in how the world works beyond Utah's borders. I wanted to know what a subway was. I wanted to know what other cultures were like." Her wanderlust took her on a series of adventures - working as a fire lookout, a wilderness forest ranger, a ranch hand; attending college and carpentry school; marrying again and having babies, Megan and Emil, now 28 and 24. She left behind not just home but also Mormonism. Today, Butters shuns all labels. "They're divisive," she said. "I want to be a member of the church of each other. I want to honor all people, all cultures. I can't participate in that 'I'm a member of a church, and I'm right,' thing." Despite her wanderings, she always knew what she wanted: to be a farmer. It took years of dreaming, saving and scheming to get there. She and her family were pinching pennies and living in the Hotel Moscow in 1986 when she finally bought 5 acres on Wild Iris Lane, a gorgeous, rolling plot in the famed honey-colored farmlands of the Palouse region of northern Idaho, where she raised her kids without indoor plumbing or a television. But the fulfillment of one dream led to the end of another. She was soon divorced again. "He was a city guy. He wanted to travel the world. I wanted to stay home and put a roof on the barn." On her own, she began to scratch a living out of what would become MaryJane's Farm. Her entrepreneurial start came in 1990 with a big bag of dried garbanzo beans. A neighbor shared his bumper crop with Butters, who decided to grind them and make a falafel mix to sell at the farmers market. Over nearly two decades, her offerings have expanded in every direction, including a semi-regular magazine, MaryJanesFarm, which is being acquired by the publishers of Mary Engelbreit's Home Companion. Her home-decorating items are sold exclusively at Belk departments stores, a chain of 400 outlets throughout the South. She has more than 50 private investors, though she remains majority stockholder. Her popularity may have reached critical mass in 2003, when Martha Stewart was facing charges and a prison term for her part in an insider trading scheme. Lifestyle purveyors were searching for a potential replacement. "There was the gay Martha and the black Martha. I was the pioneer Martha," says Butters, who hated the comparison. "It was degrading to her and it was degrading to me." Today, a three-story, work-in-progress farmhouse with red-rimmed windows and a rooftop reminiscent of a grain silo soars above the property. Lush berries fill a fenced area too big to be called a patch. Well-kept rows of lemon cucumbers, blue potatoes, cherry tomatoes and curly kale cover another section. Chickens provide a gentle scratch-and-cluck backdrop for conversations. A vintage, turquoise flatbed truck sits alongside the coral pink Mercedes that runs on homemade biodiesel. A hive of workers help her keep the Farmgirl machine running, from packaging to book and Web design to weeding the garden. Creative young women come to learn at Butters' knee and help bring to life her ideas for crafts and recipes. Her third husband, Nick Ogle -- a neighbor who joined her at the farmers market in those early days as he looked for creative ways to preserve his own farm's longevity -- oversees the mail-order business. Her daughter and son-in-law, Lucas, both help out, usually with Butters' only grandchild, Stella, in arm. It hasn't been an easy transition from farmer to entrepreneur. State officials refused to take her seriously when she sought certification as Idaho's first organic manufacturer. "They were rude to me, snickering while I gave my presentation. I was fighting tears the whole time," she said. One official told her he wouldn't let "you people put the word 'organic' on your food because you get more money for it and it isn't any better." Times have changed. Organic food now makes up the fastest-growing segment of the food industry, growing nationally at a rate of 20 percent each year since 1990, according to the U.S. Department of Agriculture. The U.S. market is expected to exceed $30 billion this year. Laura Johnson, a marketing manager for the state Department of Agriculture, said Butters had a tough haul, but Idaho is lucky she held on. 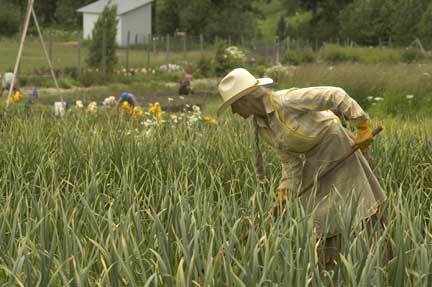 "MaryJane has been a pioneer for organic production in Idaho. She's been a real success story, generating a great deal of publicity for Idaho and the Northwest. It provides spillover benefits for the rest of Idaho agriculture," she said. Although she'll turn a profit this year, money remains an issue. Not because she wants to travel the world or live in a lavish home, but because she still has work to do. "I need money just like I need a sharp hoe," she said. Setbacks, including a devastating farmhouse fire in 1996, aside, Butters has shown either great luck or incredible foresight. She tapped into the organic movement just as it was about to blossom, and she caught hold of a renewed fascination with the quaint art of homemaking. "There's a mood in the country that's a return to the roots - even if you didn't have them," she said. "It's more the therapy of it." The thing she may be most proud of, however, is the community of farmgirls she has had a hand in helping create. Thousands of women meet online at www.maryjanesfarm.com to share ideas and offer support, or they gather in kitchens and living rooms as part of the nearly 400 Farmgirl chapters that have been started in seven countries. When Manti resident and farmgirl Kate Talley suffered a serious bone infection earlier this year, she received handmade gifts, poems and cards from women she'd never met face-to-face, including Butters and her daughter. "I'd get the mail and just cry," she said. That's the best payoff Butters can imagine. "It's all about people for me," said Butters. "I learned that from Mormon culture." Kate Talley had lots of support last year when she developed a dangerous bone infection. Women flooded the house with get-well cards, poems, even a handmade apron and crocheted dishcloths. But the love and encouragement didn't just come from next door, around the block or even the same county. They poured in from across the nation, from women Talley had never met face-to-face. "These women are just amazing," she said of the distant friends who helped keep her going. They make up an old-fashioned sisterhood brought together in a high-tech way - fellow "farmgirls" who have gathered, online and in person, to celebrate a lifestyle that is closer to nature and slower in pace. The "farmgirl" community was launched by MaryJane Butters, a Utah native who started an organic farm in Idaho more than two decades ago and today heads a lifestyle empire, complete with books, magazines, linens, dried foods and more. Butters has thousands of followers, spanning 46 states and seven countries. Her followers' creed says a farmgirl believes in friendship and community. She makes things with her hands. She is kind, gentle, patient and generous. "We take back the joy in everyday things, in teaching our children the pleasure of setting the table and eating a meal together, or picking the apples off our tree and making applesauce that we'll eat all winter together," said Talley, of Manti. "I just love it." Talley stumbled across the Farmgirl phenomenon when she discovered MaryJane's Farm magazine. "That first issue I read cover to cover. It hit home for me as a mother wanting to have a simpler life," she said. Making a meal, hanging the laundry to dry, mending a sweater. "Those were the important things in life, not having an SUV. . . . This is something that's been lost in America." From the magazine, she found the Web site and the "Farmgirl Connection." There she met women from overseas as well as some practically in her backyard. Today she belongs to the Rural Utah Farmgirls chapter. She and her fellow members are all urban refugees. Their leader, Jenny Pipes, grew up in a California beach town, but always dreamed of having a farm. Now she has two-thirds of an acre, a garden, a cow, two sheep, an angora goat, rabbits and chickens. "I have a mini farm," she says. Last spring, Talley left the Salt Lake Valley to live in a pioneer-era home a few blocks away. Another member, Libbie Zenger, also formerly of Salt Lake, is 90 minutes southwest in Elsinore, on the land her great-great-grandparents settled. All the women say they were looking for a simpler way of life, although there's nothing simple about raising your food, mending your socks and getting your milk from a cow rather than the store. "We were all so amazed to find a sisterhood, that we all like the same things," said Pipes. "Not very many people want a cow. They may think it's a cool idea, but when it comes down to it, they don't want one in their backyard." Like the Utah women, she is nostalgic about a bygone era, a simpler time when we were more innocent, more neighborly. "Women were still at home back then. You weren't a chef, you just cooked for your family. . . . Now women stay home alone and watch Oprah," she said. Women, she believes, need to find a way to reconnect. Not just for our neighborhoods, but also our land. "We're the fastest-growing group of people buying small farms," she said. "We're more nurturing, more futuristic. It's more, 'How can I make the world a better place?' rather than 'How can I make a buck?' "
The Rural Utah Farmgirls, who all have met Butters in person, corresponded with her in e-mail or received a personal note from her in the mail, say Butters is the real thing. "She's so normal and down to earth," said Pipes. "It's just like having a big sister." She has been an inspiration to the Farmgirls. Libbie Zenger earned a scholarship to spend a week at Butters' Pay Dirt Farm School, where would-be growers come to learn the principles of organic methods. "She was just so generous with me. I thought, 'This is someone you can trust.' "
Zenger has put those lessons to work on her small spread, and she's never regretted leaving the city. "Part of the joy of the farm for me is learning about myself," she said. "There's something about being able to do your work and look up at the mountains and breathe the fresh air and see your kids running around chasing chickens . . .
"I think this is my style." * JENNIFER BARRETT can be reached by e-mail to jbarrett@sltrib. com. Her phone number is 801-257-8611. Send comments about this story to livingeditor@sltrib.com. * Butters' magazine, MaryJanesFarm, is available on her Web site for between $10 and $13. Stay at the bed-and-breakfast at MaryJanesFarm and you'll be treated to homey meals made with fresh ingredients that come straight from the garden or the chicken coop. Here are some typical dishes a farmgirl might eat during her stay. Recipes courtesy of MaryJane Butters. To the bottom of each jar, add 1 teaspoon melted butter. To the bottom of each jar, place 8 small spinach leaves. Make a slight indentation in the spinach and crack 1 egg into each jar. Pour 1 tablespoon heavy cream on top of each egg and sprinkle each with 1 tablespoon Parmesan cheese. Season with salt and pepper to taste, adding a pinch of nutmeg if desired. Place all four jars in glass baking dish. Pour 1 cup water into baking dish, surrounding jars. Place baking dish on middle rack in preheated oven and bake for 20-25 minutes, or until eggs are set. *Note: For a slightly firmer egg, place jars in baking dish without water. Butters says these meals-in-a-packet are the perfect end to a day in the outback, but they're also a fun and convenient dinner for any home cookout. Simply arrange individual portions of meat, vegetables, herbs and butter on squares of heavy-duty tinfoil; twist to close; and place directly in the hot coals of your campfire. For this hobo dinner, Butters started with organic meatballs, potatoes, carrots, spinach and zucchini, then added a squeeze of lemon, slices of Granny Smith apples and sprigs of thyme. Cooking times vary according to ingredients. Let your nose be your guide - when it smells like a delicious dinner, it's done. Use your camp shovel to lift the packets from the coals. Butters says her all-time most popular craft with farmgirls is an apron made from a man's shirt. "In my mother's day, women used to take the collar off a frayed shirt, turn it around and stitch it back on. When that side wore out, they often used the fabric to make something else - a quilt, or in this case, an apron," she writes on her Web site. Detailed instructions for creating a Make Do Apron can be found at www.maryjanesfarm.org/make-do-apron.